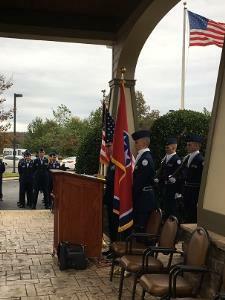 The Hixson High School Air Force JROTC Cadet Corps held a veterans appreciation event on Thursday at the Morning Pointe assisted living facility in Hixson. The Wildcat Cadet Corps showed up in full-force with over 90 Cadets and a Hixson High Band member participating. The event began with the Color Guard presenting the colors to our National Anthem. 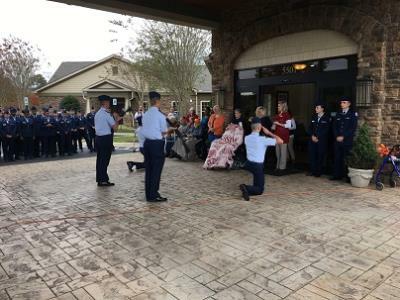 Next Cadet Colonel Logan Griffith recognized each of the 13 veteran residences of Morning Pointe by announcing their name, rank, branch of service and significant achievements. 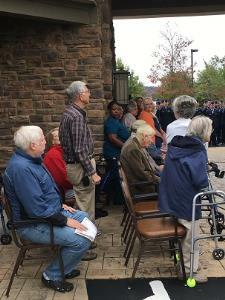 Each veteran received a rousing applause from a grateful audience. The cadets then prepared and executed a Pass and Review, a maneuver that required all 90+ cadets to march in squadron formation and perform a hand salute to the Veterans while marching. As a special treat to the residents, the cadets performed a four-person exhibition drill routine that thrilled residents and cadets alike. 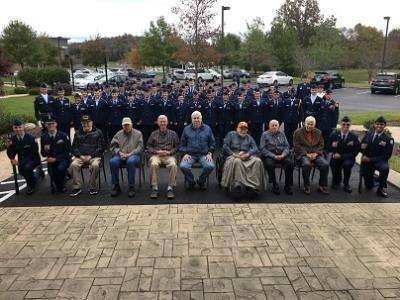 Rounding out the event the cadets and staff of Hixson High School AFJROTC spent time speaking with the veterans and residents of Morning Pointe. The Air Force JROTC program has a rich in history and has been a part of Hixson High School since 1973. The Air Force JROTC mission is to “Develop Citizens of Character Dedicated to Serving their Nation and the Community." The cadets are immersed in an exciting four-year academic and leadership program with community service at the foundation.